ACE Selling details how salespeople can increase their sales results by employing the same skills used by today’s top poker professionals to find strategic advantage and boost sales success. Awareness – Ability to gather information to validate potential opportunities. Competitiveness – Ability to compete and win. Execution – Ability to take decisive action. 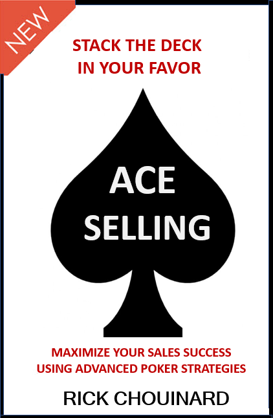 ACE Selling mirrors the sales process with a poker hand providing valuable insights to boost sales success. ACE Selling discusses specific skills to teach salespeople: How to think strategically, how to gather necessary information to improve decision making, and how to exploit opportunities when you have the advantage. You will find specific examples that will propel you forward and help you close more deals. Deal yourself in on the ACE Selling edge.